I am so very close to finishing up my Evenlight. I returned to it Sunday night and managed to finish up the first sleeve last night. Before starting the second, I even wove in all my ends. I'm now well on my way on the second sleeve, and if all goes according to plan, the sweater should be done by this weekend -- a good thing, too, because it's supposed to be rather chilly and I might just want to wear a sweater. I did end up having to buy a third skein of yarn, and luckily my LYS had one more in stock from the same lot as the original two skeins. For the sleeves, I've been alternating the new skein with what was left of one of the originals after I finished the body. There was only a tiny amount leftover from one of those when I finished the first sleeve, so I should be using up nearly all of the original skeins. While I'm sure I can make good use of what's left of the third skein, I am a little bummed that I had to buy more, especially when you consider that I had more than what the pattern specified to begin with. But I guess it happens, and in this case it all worked out okay. In other projects, I've nearly finished the first of my pink striped socks, which got most of my attention the last couple of days we were away. I've only been working on them during my lunch break at work, so progress has slowed a bit, but I expect the first one at least to be done shortly. Usually I don't worry so much about stripes matching, but I'm going to try to match up this pair, especially because the striping sequence worked out so nicely with the heel. I was really hoping that I wouldn't get the odd one or two rows of a different color on the instep, and it worked out better than I hoped. The stripe sequence in this yarn is short enough that I shouldn't have an issue with having enough yarn if I wind off some to get to the same starting point for the second sock; the last time I used this yarn (following my same generic sock recipe), I used less than 350 yards of the 400 yard skein. I haven't forgotten about my handspun Hitofude; it is waiting patiently until the other sweater is finished. Considering that it's a lightweight sweater, I'm not in any rush to finish it right now. The Gradient-along technically finishes up at the end of June, and I think another three months should be plenty of time to get it done as long as I work on it regularly. It's unusual for me not to spin for more than a week, but in this case, it couldn't be helped as it would have been extremely impractical to try to bring a wheel with me. My fingers were itching to get to some fiber, though, so today, as soon as I'd done all the cleaning and errands and stuff that had to be done, I sat down at my wheel for several hours to catch up on some video podcasts and start a new project. This is Comeback wool, a breed out of Australia that shares some characteristics with Merino, Polwarth, and Bond, in a colorway called Westringia (an Australian shrub). I decided to spin a relatively quick and dirty two ply, so I split the top in half and started spinning. In the span of maybe two and a half to three hours of spinning off and on, I nearly finished the first half. That little bit of wool you can see off to the right behind the bobbin is all that's left to spin of the first half, and I may try to finish it up after I post this. I picked Targhee for my fiber choice for this round, and I'm really looking forward to spinning it (Targhee being one of my favorites). I need to do some thinking about how best to spin it, though. I think the two colorways could look really good plied with each other, but they'd also be pretty spectacular on their own. If you'll ignore the sweatshirts that are covering most of the chair, you'll see that I have a pretty comfy seat. It's also noticeably higher than the old chair, so I'm in a much more ergonomic position when I sit to spin. The footrest is perfect for holding my kates and miscellaneous spinning stuff, too. I predict many happy hours of spinning in this chair! Is it really Thursday already? The week has flown by. We have one more full day of vacation (sob!) and will be heading home on Saturday. Fortunately it seems we have missed the nasty last blast of winter, so we'll be headed home to spring, really and truly. After the first swatching fail earlier in the week, I spent Tuesday evening ripping out and then reknitting the swatch for my Hitofude Cardigan, this time in the correct stitch pattern. I knit two repeats of the lace in three needle sizes (US 4, 5, and 6, or 3.5, 3.75, and 4.0 mm), then blocked the swatch overnight. I settled on the 6/4.0 mm, and I'm still the tiniest bit off on gauge, but I think that I can work out the difference with some aggressive blocking. I made the smallest of starts last night, which you can see here along with my swatch. All that time turned into a bit more than five inches of knitting, so I'm nearly done with the leg of my first sock! Did you happen to notice, by the way, that all my knitting is currently pink? I promise that was not intentional, but it is a funny coincidence. We're hoping that we get one last pool day in tomorrow (personally, I'm hoping to get through a couple hundred more pages of my 1,000-plus-page book), and then it will be back home and back to the grind. As sad as I will be to have to go back to work, though, I am looking forward to getting home to my other WIP, a sweater that is just a sleeve and a half away from being finished! I'm posting from beautiful, sunny, warm Florida, where we are wrapping up our second full day of vacation. It's been incredibly restful so far -- and that's exactly what I was hoping for. This isn't the longest trip (we'll be headed back home Saturday afternoon), but some time away from the cold and the stress of work is doing me worlds of good. Because you're going to ask, yes, I did finish them while sitting by the pool. I was forced to do so next to the pool rather than in it because the pool had to be shocked and we aren't allowed to go in until tomorrow. A certain 6-year-old was probably the most disappointed by this news, but I was perfectly content to sit and knit while catching up on some podcasts. I brought a skein of Fibernymph Dye Works Bounce self-striping that will be going on the needles next. The US 5 was used on the bottom and the US 6 on the top. The pattern's gauge is 20 stitches and 32 rows. But you will see my error right away -- I swatched in stockinette, and of course the pattern's gauge is given over the lace pattern. So it looks like I'll be ripping and reswatching tonight instead of casting on. In a way I'm a bit relieved, because the pattern calls for a US 4/3.5 mm needle to be used, and even with the 6, I was still getting 22 stitches over four inches. The fabric is light enough that it would be too loose with a larger needle. I'm hoping that once I swatch the lace, which will of course be blocked a little more aggressively than stockinette, I'll be closer to the correct gauge, perhaps even on the smaller of the two needles. You know this spinning project well. I've been working on it since almost the beginning of the year, and for a time there, it seemed like it would never end. But it finally has. And I'm in love. I had spun the singles very fine on purpose because I know how Polwarth poofs up when it's washed. I knew that to get yarn that was the correct thickness and to have a chance at enough yardage for the planned project, I needed to err on the side of singles that were a little finer than I'd normally spin them. It turns out my planning worked out perfectly. I was worried about getting enough yardage, but it all turned out well in the end. The pattern specifies 980 yards for my size; I got a bit more than 1,150. So I should have enough for swatching and the project. I wound up this giant skein yesterday (boy, was my arm sore after that! ), and it -- along with a skein of sock yarn -- are in my suitcase to go to Florida later today. Rainbow and I are headed down for about a week with my parents (please pity the Mister, who has to stay home and work), and I'm looking forward to some good knitting time! As I predicted, my handspun socks are moving along very quickly (or at least much more quickly than the last two pairs did). I finished the first sock last night and promptly cast on for the second this morning. I knew going into this pair that there would be a fair amount of black in the socks (really, what did I expect from a colorway called Death? ), but I did not think that there would be such a stark contrast between the two socks. It seems that one sock is nearly all black and dull and the other one will have all the fun colors in it. Such is the nature of knitting with handspun, I guess. I doubt I will finish up the second sock by the weekend, so these will likely be coming with me to Florida, where I expect they will be completed in due course. In the past couple of days, I have pulled out my Evenlight again, and suddenly it seems be knitting up a lot faster than it was before. I think I have just a few rows left to knit before I reach the target length for the body at which I am to start the ribbing at the bottom. That ribbing is only supposed to be about four inches or so, so that should be relatively quick to knit. While I'm very pleased with how the sweater is knitting up, I'm starting to get a little worried about the amount of yarn I have leftover to knit the two sleeves and the collar. The pattern says I need 1050 yards and I have almost 200 yards more than that, but the balls of yarn are starting to get quite small. I suppose if need be, I could always undo part of the ribbing at the bottom of the body and use that if I need to, because I'd hate to have to buy another 600+-yard skein that might or might not match the dyelot of the two I'm using. Tonight's first order of business before I get to the sweater knitting, however, is to finish plying up the Polwarth. I have just a little bit left to ply and then the whole huge bobbin to skein up and wash. I want to make sure I have time to let it dry thoroughly. Assuming my yardage is enough for what I have planned, I'll need to wind it up so it's ready to knit and perhaps even swatch before we leave for vacation. Sometimes when I'm designing I find that I can't get a stitch pattern out of my mind. That was the case with this one, even though I'd worked it many times while knitting the cowl. 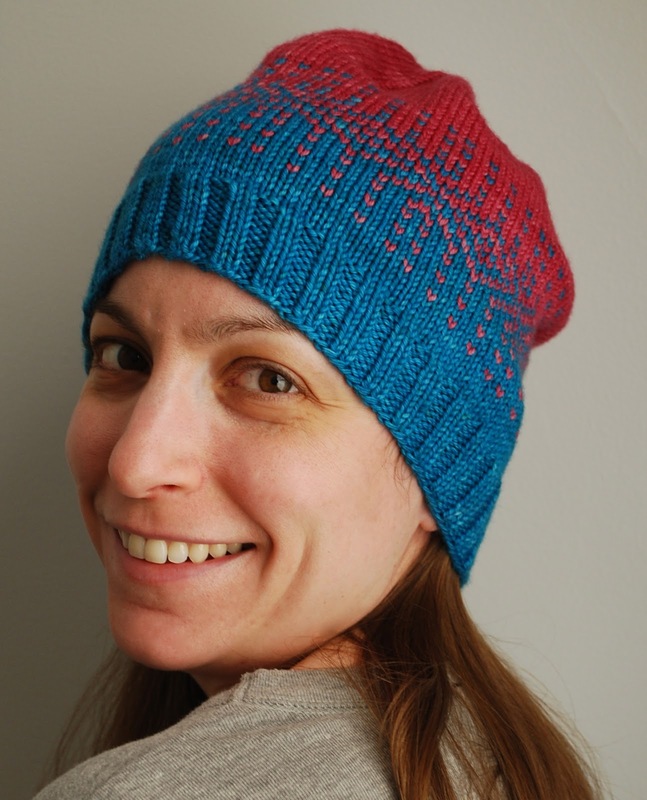 I kept thinking that it would look great as a two-tone hat, and as luck had it, I had two skeins of one of my favorite yarns, Yarn Hollow Tor DK, that I'd rescued from the orphans bin at my LYS last fall. It didn't take me long to wind the skeins and cast on. And in a couple of days, I had a hat. The hat is worked from the brim up, starting with the first color. After the ribbed brim and a few plain rounds, the colorwork begins. The dominant color gradually shifts to the second color, which is used to finish out the crown. The pattern is written for three sizes -- Child (Teen/Adult Small, Adult Large), to fit a head circumference of 20 (22, 24) inches. You'll need two colors of DK-weight yarn to knit this hat; two skeins of the yarn I used for the samples was enough to make the two hats (one with a pompom) and still have leftovers. The colorwork pattern is charted only. 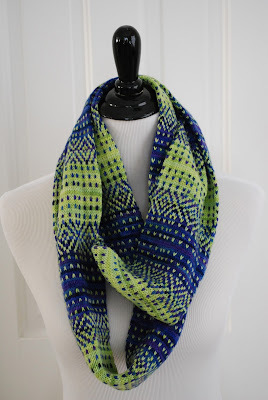 The pattern has been tech edited and test knit -- you'll have to keep an eye on the projects to see the amazing color combinations the test knitters came up with! After more than two months of spinning singles, I finally made it to the plying stage on my Gradient-along Polwarth. Plying takes less time than spinning singles, but it still takes time. I had the day off from work on Friday and spent probably three hours at the wheel in total. I spent about another hour at it yesterday and about half an hour today, and I'm only about halfway done. You can see that I'm just getting into the more red purple that was the final color on the first braid, so I'm just past the halfway point. I'm going to spend a bit more time plying once I post this, and my hope is that if I can manage a few more hours this week, I'll be able to finish and wash the skein before Rainbow and I head to Florida for a little spring break trip on Sunday (assuming I get enough yardage for the intended project, the yarn will be coming with us). The colorway I received is called Closer to Home, and it's on oatmeal BFL. It smelled nice and sheepy when I pulled it out of the bag. This is really only the tip of the iceberg when it comes to my SCF stash, too. Since Rainbow and I did the big stash reorganization several weeks ago, I've filled an entire shelf of the built-in unit in the closet just with SCF fiber. I've really got to get spinning! One of the perks of my job is that we occasionally have random days off. One of those days is tomorrow, our "spring holiday," so I find myself on the eve of a three-day weekend, one in which I'm hoping to be very productive as far as my crafting is concerned. What's amazing is that there's probably room for another couple of ounces on this giant bobbin. One of these days I'll have to see just how much I can actually fit. My handspun socks are moving along really quickly -- I'll already at the heel. It's amusing me that I did all that moaning about knitting dark socks and here I am knitting basically black yarn for socks for me. At least there are some bright colors up ahead. I don't know how the weather has been where you are this week, but it has been amazingly warm here this week. Yesterday was my birthday (yes, I turned 29 -- again! ), and it was warm enough here that I was wearing a T-shirt and had to take off my wool socks. Our spring flowers are coming up quickly and our trees and bushes are sporting buds, so it looks like spring really might be here. It makes me a little sad that I have that lovely sweater still only half knit (and that means that it'll be way too warm to wear it once I do manage to finish it), but I suppose that it will be a nice little gift to myself to have a brand-new sweater to wear come next fall. Soon it will be time to wash all my sweaters and pack them away, and then I suppose it will be time to start knitting light lacy things. As much as I love wool and sweaters and all the traditional knitterly things, I can't say I'm sorry to see winter go. Friends, I have good news: The man socks are officially done. I did not knit fast enough to deliver my dad's socks to him on Friday night, but I did finish them up over the weekend and they will be handed over very soon. There's not much to say about these socks. They weren't nearly as boring as the black ribbed socks, but it was close. I had to turn on all the lights in my bedroom to Kitchener the toe because of the dark yarn and my aging eyes, too. I am pleased with how they came out, though, and when my dad tried on the completed sock on Friday night, it was a perfect fit, so that makes me happy. I will be happier, though, if I don't have knit dark man socks again for quite a while! Because I finished this pair up on Sunday night, I had to pick something quickly to pack in my work bag for my lunchtime knitting. I decided on a skein of handspun that went with me to Florida in December but wasn't touched -- it has been waiting patiently, after all. The yarn was superwash merino from Into the Whirled that I spun last year as part of the Mega SAL; the colorway is called Death (quite cheerful, don't you think?). I cast on yesterday and already have the cuff and about an inch of leg done. I'm knitting these on my more usual US 0/2.0 mm needles for a denser fabric, and the ribbing is definitely quite dense. I have a feeling that after all the ribbing I've worked on the last two pairs of socks, these stockinette ones are going to fly off the needles. My First Point of Libra has been getting regular attention, and I'm quickly approaching the end. I finished the first border last night, so tonight I will bind that side off and begin on the final border. For a while there I really thought I was going to have a ton of the handspun left, but the ball of yarn has gotten noticeably smaller in the last couple of days. I have small amount of the gradient set colors leftover as well, perhaps enough for another square for Rainbow's long-neglected log cabin blanket. Hmm, perhaps when the shawl is done I should dig that WIP out of hibernation. So many ideas, so little time! Despite my best intentions to spin more this past week, I ended up doing more knitting, so I did not finish spinning my Polwarth singles. But I will be very soon, perhaps as soon as tomorrow evening. I've reached the final color in the gradient and have about an arm's length left of fiber to spin. If all goes as I hope, I'll begin plying later this week. My goal is to have finished yarn in the next two weeks, as Rainbow and I will be heading to Florida for a little vacation two weeks from today. Assuming I have enough yardage, my plan is to take the yarn with me and start the sweater. Keep your fingers crossed that I do, or else I'm going to have to go back to square one on this plan! Last night I was supposed to go to knit night. I finally had a Wednesday when the Mister was in town/home to be with Rainbow -- the first one this year, actually -- and I was all excited. And then no one else could come. So I spent the evening having a quiet dinner by myself, knitting a swatch for a design submission, and then curling up under a blanket to watch old episodes of Gilmore Girls and work on my shawl. I am now officially on the border, with two garter ridges down and 13 more to go on this side. I think I am going to put this project on hold for the time being, though, in the interest of finishing up my father's socks. I finished the heel on the second today, and I think if I can buckle down and work on it tonight and tomorrow, I might just finish it in time to present him with the finished pair when we have dinner with my parents tomorrow night. This weekend I am headed to the Pittsburgh Knit & Crochet Festival for the first time in many years (I think the last time I went was 2008). I'm taking a class on Saturday morning and then might stroll through the marketplace a bit, though I'm not really planning on buying anything (shocking, right?). I'm planning to wear my Zeccola Cowl -- the original sample -- so if you're there and you see me, please do say hi! As I had intended, I have been working steadily on my First Point of Libra in an effort to get it wrapped up as quickly as possible. I'm feeling pretty good about the progress I've made, and I can definitely see the end in sight. I'm nearly finished with the penultimate stripe in the gradient, and if I can get Rainbow to bed quickly enough this evening, I might even finish the last one. Then all that will remain is the borders of the main color. One thing that I have been doing with this shawl to keep myself from being crazy at the end is weaving in the ends as I go. Each time I've finished a stripe or a section, I've woven in the ends. I'm leaving little tails on them so that if I stretch the shawl when I block it they won't pop loose (if you leave a bit of a tail and the fabric stretches, some of that excess can be pulled into the fabric), so all I'll need to do at the end is trim them. Weaving in ends is one of those things that I don't exactly despise doing, but it certainly takes time that I'd rather use for actual knitting. This shawl does have a lot of ends (I think about two dozen, if I'm counting correctly), so that would likely take a good portion of an evening to deal with if I left them all for the end. This way, I can spend about five minutes here and there and save myself the aggravation. I got a good amount of additional length when I blocked it (it's now approximately 68 inches around), and it fits perfectly around my neck doubled. I wore it over the weekend, and I wore it to work today (it was pretty chilly this morning). It works perfectly to keep me a little warmer when it's not cold enough for a sweater. I ended up using about 767 yards total of the two yarns, so just slightly less than the total used for the original. I probably could have squeezed out two more repeats if I really wanted to, but I'm happy with the length I got. The leftovers will go into the stash and perhaps become a square in Rainbow's log cabin blanket, if I ever get it out again. My father's socks are still in progress and moving along regularly. The first sock was finished Friday night, and now I'm a little more than halfway done with the leg of the second sock. I'd like to finish them up as soon as possible, though I'm not sure that that will happen this week. I do, of course, want to get them to my dad soon so he can make some use of them before spring really comes, and I think he'd be happy to have them now, as he's been sick for the past week. He and I are alike in that our feet are always cold, so I'd love to help him feel better with some cozy wool socks!